We knew there were lava tubes on the moon and Mars. But we thought the ones on the moon were no more than 500 meters in diameter. A recent study of gravity data shows two voids larger than that, and an engineering study shows the tunnels can be up to 5 km across - large enough for a substantial city. Lava tubes are caves formed when lava from a volcano flows underground, then leaves behind a cylindrical tunnel. Caves like this on earth can be up to 30 meters across. Gravity surveys of the moon indicate much larger voids under the surface. A new study indicates that A) tubes over 1 km in diameter may have been detected under the surface by the GRAIL orbiter, and B) a natural lava tube of up to 5 km may be stable under lunar conditions. Earlier estimates were 500 meters maximum, but this assumed a softer material for lunar basalt. The 5 km estimate for a maximum void is based on ideal conditions and a natural arch geometry that is mathematically close to those of earth lava tubes (which given the variation in gravity, may or may not be true). But it would account for the 1000 meter voids that appear to have been detected by GRAIL. The two largest tubes detected are at Vallis Schroteri and Rima Sharp. The problem is that GRAIL data would be identical if the voids are 3 centimeters or several hundred meters below the surface. For reference, a tube would have to be at least 5 meters below the surface to block cosmic rays, and more is better. The temperature below ground would be consistently – 20 degrees C, or -5 degrees F. This is far better than the dramatic variation at the surface, although this variation is less extreme near the poles. 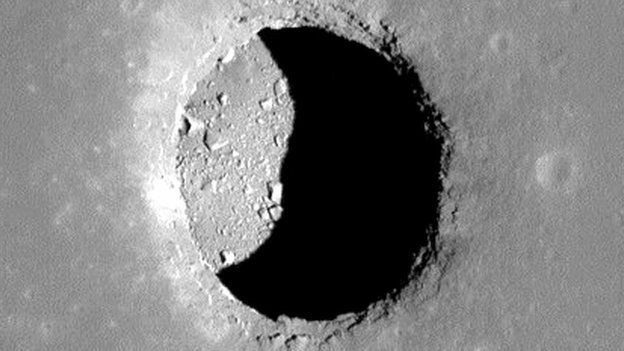 Lava tubes are generally found near the edges of lunar mares and highlands. After finding three apparent pits or skylight caves from earlier probes, LRO found an additional 150 candidate holes in the surface. Even a simple pit (with no useful lava tube) would provide cosmic ray and meteor impact shrapnel (ejecta) protection from the sides for a small outpost. PROBLEM: The lunar surface is exposed to extreme temperature changes between night and day, cosmic radiation, solar flares, and micro-meteor "rain". The trouble is finding these caves, determining their size and determining how large and accessible they are. This study does a lot of work in that direction. OPPORTUNITY: Being able to drop under the surface without having to dig for it removes a substantial engineering task from the earliest outposts, by simply lowering the base habitat into a skylight cave and connecting it to the surface. Lava tubes under the surface could theoretically be lined, sealed, and pressurized into vast habitat spaces with minimal excavation. Next Big Future Blog Article.